A Cuban woman waits on the Hidalgo-Reynosa International Bridge Thursday, June 7, 2018 after five days of waiting to be allowed entry. HIDALGO — When Yasir set out from Piñar del Río, an eastern province in Cuba and the island’s tobacco hub, he never imagined that when he finally reached the U.S.-Mexico border he would find himself camped out on the pedestrian bridge separating the two countries. 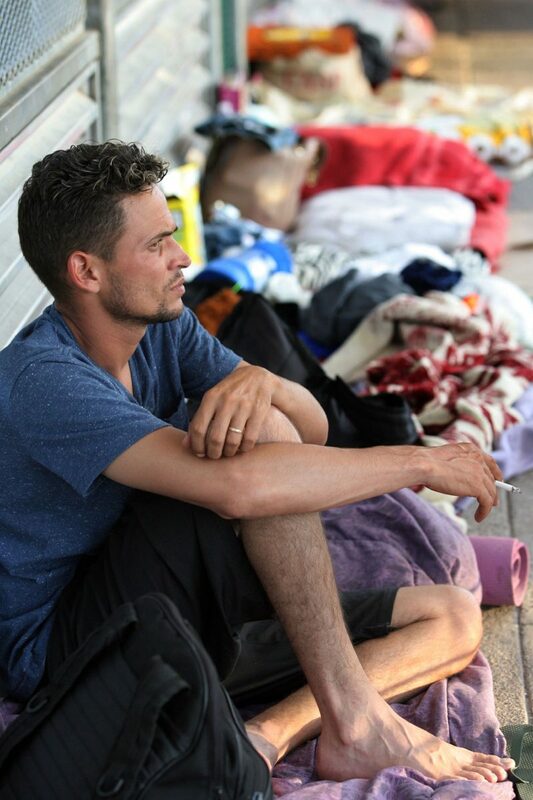 As the sun began to set Thursday, the 24-year-old sat atop a piece of cardboard cushioned with blankets, surrounded by his fellow countrymen in the same predicament who for nearly three weeks have lined the final yards of the Hidalgo-Reynosa International Bridge. 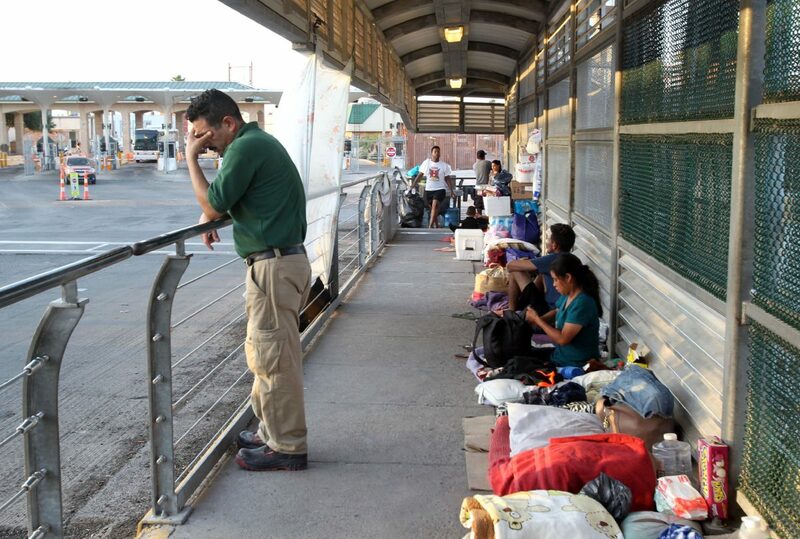 They prepared themselves for another round of sleep on the bridge’s unforgiving pavement, just feet away from the chain-link gate standing between them and their dream of reaching the United States in search of political asylum. As Thursday marked his fifth night on the bridge, Yasir’ eyes glinted in the sun’s rays, belying the frustration of waiting literally at the feet of those crossing the bridge — Mexicans and Americans who come and go as they please by simply presenting a U.S. passport or Mexican ID card to the customs officials at the gate. Local church workers sit alongside Cubans Yasir, 24, second from left, Yaneth, 30, and Katia, 28, on the Hidalgo-Reynosa International Bridge on Thursday, June 7, 2018. 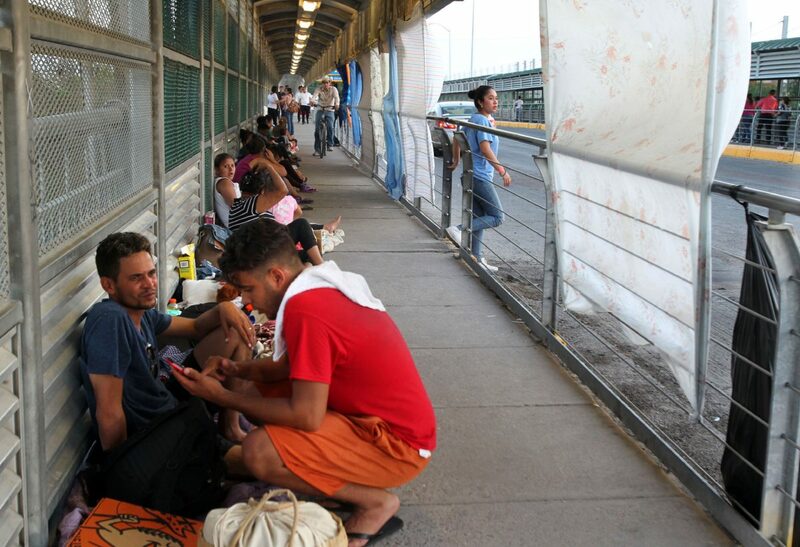 The Cubans, who are all from the province of Piñar del Río, are seeking political asylum in the U.S.
Hector, 28, sits on the Hidalgo-Reynosa International Bridge Thursday, June 7, 2018 while he waits to be allowed entry after four days of waiting. He left Cuba by boat nearly two weeks ago, arriving in Cancun, Quintana Roo, Mexico. Cubans and Central American asylum seekers get ready to spend another night on the Hidalgo-Reynosa International Bridge Thursday, June 7, 2018 after U.S. Customs and Border Protection officials wouldn't allow them entry. 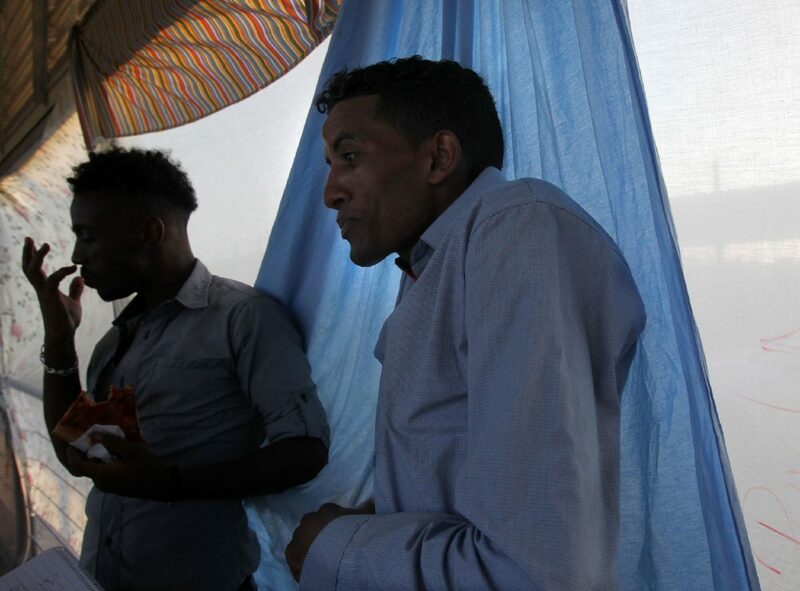 Bereket, 26, and Zeru, 24, from Eritrea arrived at the Hidalgo-Reynosa International Bridge Thursday, June 7, 2018 after traveling by bus and boat from Brazil. The pair left their African country nearly three years ago to escape political persecution. Cubans and Central Americans wait on the Hidalgo-Reynosa International Bridge Thursday, June 7, 2018. The asylum seekers are being denied entry until beds open at local immigrant detention centers which have quickly filled as a result of the "zero tolerance" policy. Hector, 28, speaks with a fellow Cuban on the Hidalgo-Reynosa International bridge Thursday, June 7, 2018 while they wait to be allowed entry. 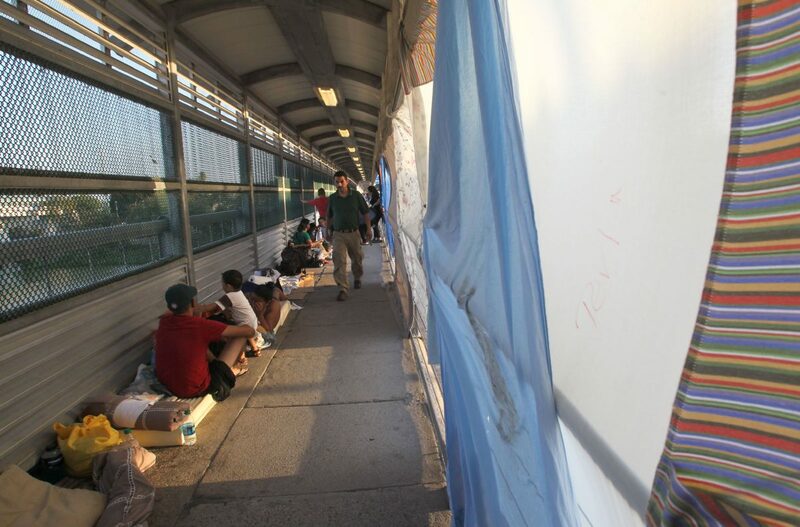 Cuban asylum seekers have been camped out on the bridge the past three weeks. A Guatemalan migrant waits on the Hidalgo-Reynosa International Bridge Thursday, June 7, 2018. U.S. Customs and Border Protection officials were telling asylum seekers that they had to wait on the bridge because detention centers were full. 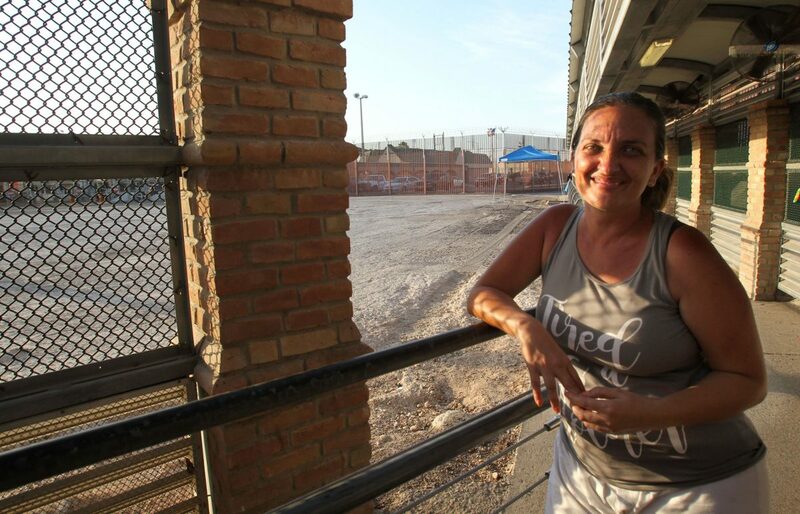 Katia, 28, from Piñar del Río, Cuba has been on the Hidalgo-Reynosa International Bridge for five days as of Thursday, June 7, 2018. The mother of four hopes to be reunited with family in Miami, Florida. He is one of dozens of Cubans, and now Central Americans, whose journey has been cut short after being denied entry due to local detention centers reportedly being at capacity, at least according to customs officials on the bridge. Now, approximately 50 people spent Thursday night on the bridge, about half of whom were Cuban. Their plight creates an ironic juxtaposition: Presenting oneself at the bridge and declaring asylum falls within legal parameters, yet they have been lawfully detained amid the Trump administration’s new “zero tolerance” policy. Enacted in April, the policy criminally prosecutes those who cross the border illegally by averting an official port of entry, detaining them until their appearance in federal court as opposed to paroling or immediately deporting them. Immigrant advocates have theorized that preventing people from immediately applying for asylum at ports of entry could be a strategy to deter people from seeking asylum. But CBP is standing by its enforcement procedures. With regard to the Cubans and Central Americans held up at the bridge, CBP considers the situation a temporary one that’s not unique, having to previously limit the number of people allowed entry for processing. To the Cubans who spoke to The Monitor, there appeared to be no rhyme or reason for who was allowed entry. Women last week said that one day all of the men were rounded up and allowed entry, along with those traveling with young children. Unlike Central American migrants arriving at ports of entry with children in tow, Cubans are traveling solo, finding family and comradery among the others they encounter on the bridge. “We all have our own reasons for leaving,” Yasir said, explaining that he decided to leave because of the lack of opportunities for advancement. His journey took him by small, rickety boat holding four others to the coast of Belize after a week at sea. From there, it was multiple bus rides north to Reynosa. Twenty-three-year-old Marlene, who as of May 29 had been on the bridge for nine days, captured the sentiment shared by her fellow asylees when she said, “Cuba es la última carta de la baraja,” which translates: Cuba is the last card in the deck. Nearly brought to tears by hopeless frustration, she recounted the lack of freedom in Cuba where she had been studying to be a nurse. She had used most of her family’s savings to purchase a ticket to Cancun, which is where she caught a flight to Reynosa, hoping to cross the bridge and reunite with her husband in Houston. According to Human Rights Watch’s 2017 review of human rights around the globe, “The Cuban government continues to repress dissent and punish public criticism. It now relies … on short-term arbitrary arrests” to punish critics, in addition to public shaming and terminating employment. It also controls almost all media outlets and restricts access to outside information. 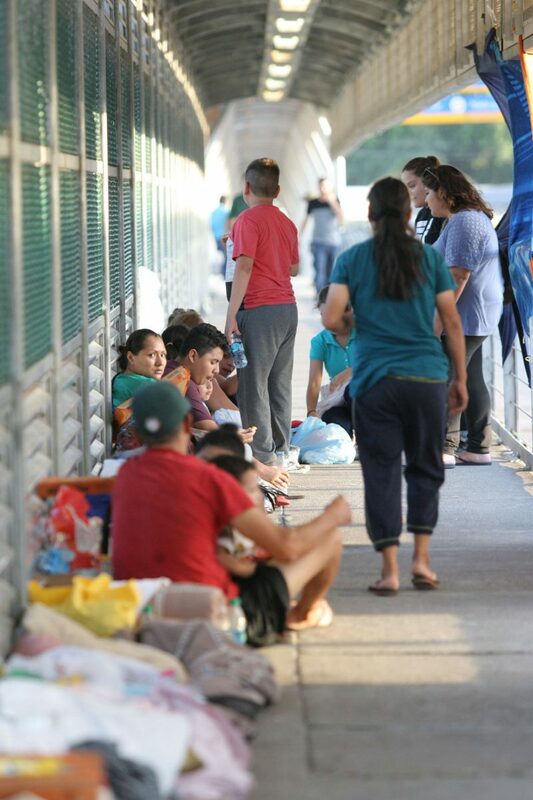 Last fiscal year, which saw the end of the “wet foot, dry foot” policy in January 2017 that granted Cubans who reached U.S. soil the right to stay and a fast track to citizenship, 14,301 Cubans sought asylum at ports entry in CBP’s Laredo sector, spanning from Del Río to Brownsville. Since October 2017, 3,959 Cuban asylees have passed through the sector’s eight international bridges to be processed for credible fear interviews to initiate the asylum process. Marlene said Cubans will continue coming so long as they keep dreaming of a better life off the island. “I’ll wait as long as I need to,” Yasir said as he contemplated the thought of another day seated on the bridge, his chance at a new life in limbo and at the mercy of America’s ever-toughening immigration policies.